Saturday afternoon at 3pm. The doors to TTT raceway opened and in came the guys and gals to take part in round 1 of the golden helmet championship. 16 Drivers came to take part in round 1. With the current Golden Helmet Champion Chelle Snowdon in attendance. Various makes of cars were ready to go. All using the Team Powers motor for this championship. Rounds were completed. 2 Semi finals of 8 cars were drawn. Let battle commence. 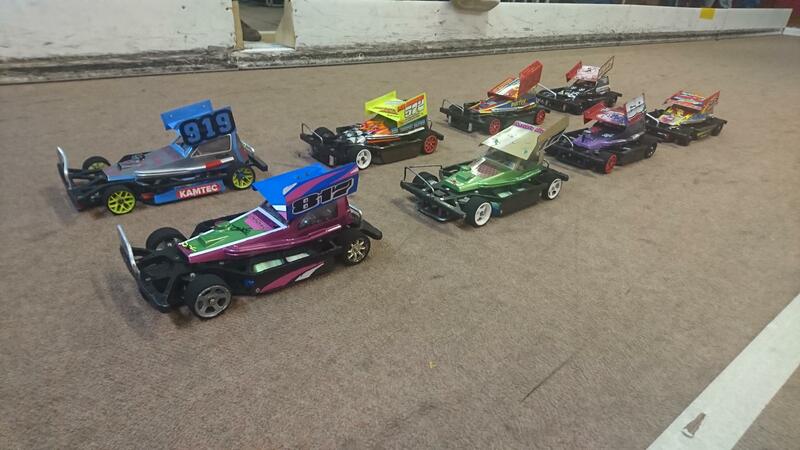 Semi 1 saw lots of fast racing, Crashing and bashing. Tim Bailey in his Mardave took the lead and pulled away. Finishing 2 laps ahead (98 laps) of Chelle Snowdon in her dot (96 laps), followed by Noah Bailey (96 laps) in his Mardave on the same lap. Fastest lap of the race went to Chelle with a 2.824. Semi 2 saw the same as semi1. Fast hard racing from some very big competitors. Definitely a race to watch. 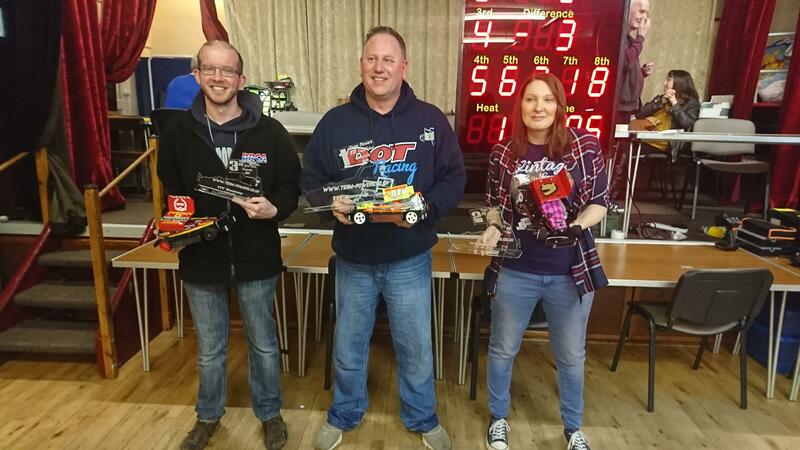 Taking the win in semi 2 was Rob Barnard in his Dot rocket on 93 laps. Followed by Ryan Stuart in 2nd place with 90 laps and 3rd was David Tomlinson on 88 laps. 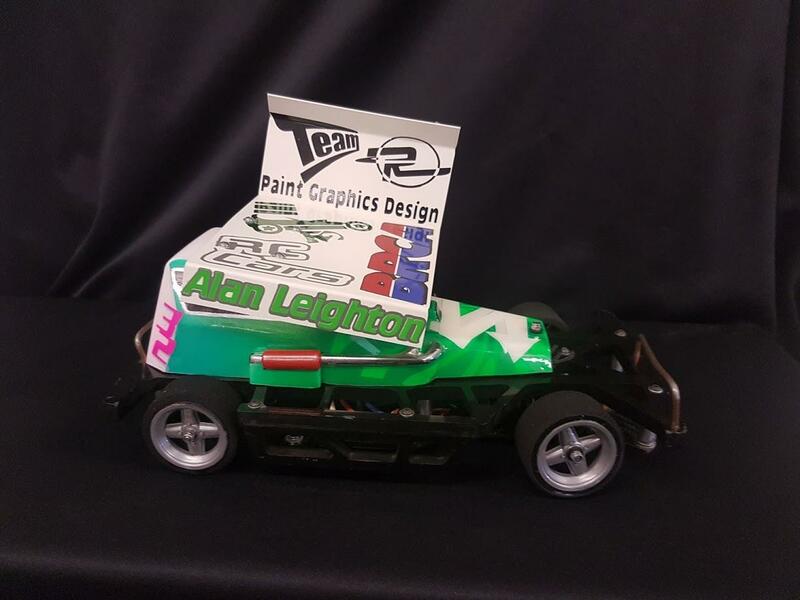 Fastest lap of the race was Mr Dot Rocket himself David Tomlinson with 2.826. Final time. Every one was excited and ready to go. Think they all wanted to get their hands on the beautiful new Golden Helmet Championship trophies. Buzzer beeped and off they went. First corner carnage as always. Everyone got sorted and off they went, fast racing. Bumpers touching, nerfs smashing. Always a fast paced race with these guys on track. And they fought till the end. After 6 minutes the timer beeped and Mr Rob Barnard took the win with 94 laps. Followed by Current champ Chelle Snowdon (92 laps), and Ryan Stuart (91 laps) came in 3rd. Fastest lap of the race went to Tim Bailey in his mardave with 2.838. Noah Bailey setting the team powers lap record at 101 laps. Sunday 6th January at 8am. 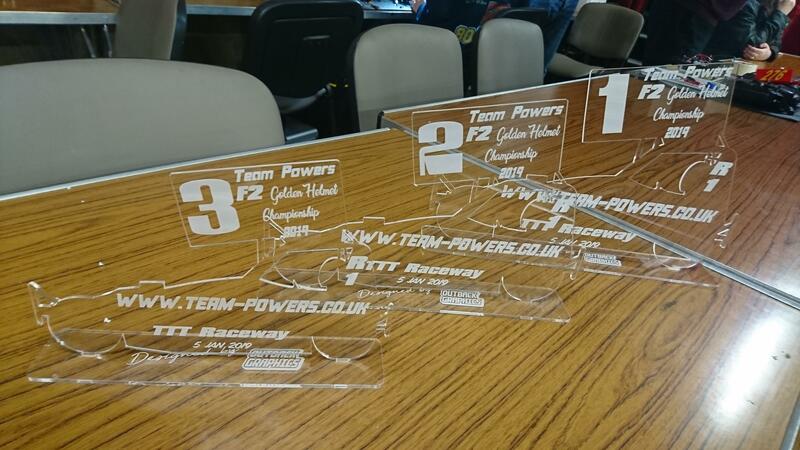 The doors of TTT raceway opened again to host the world qualifying round 1 for the f2s. Today 41 drivers descended on the track to battle it out for world qualifying points. 7 rounds of 4 heats. Top 2 straight through. Next 16 into 2 semis. Top 3 from each semi into the 8 car final. Rest into the grand national championship. And boy did they battle. Fast hard chasing. TTT (5 min) lap record was broken twice today and Rob Whalley equalled the already set lap record. First Noah Bailey taking the record with 101 laps in a faster time. Then Rob Barnard smashed Noah’s count with 102 laps. Well done guys. After the 28 heats, the top 2 drivers through were Tim Bailey and Rob Whalley. Semi 1. 6 Minutes of crazy fast racing. With Noah Bailey starting on pole position, he drove hard and lead the whole race, finishing 1st with 116 laps. Followed by Louis Selby 114 laps and Daniel Skeels in 3rd with 112 laps. Fastest lap of the race went to Simon Bassett with 2.826. Semi 2. 6 minutes of awesome, Eventful racing. Martin Nash was unlucky. His receiver broke free of the car and he was forced to retire. Which was a real shame. High up in the rankings and doing a great job. Bringing in the fastest lap of the race with a 2.727. Marshals fast on the job and retrieved his parts without further damage. After 6 minutes Rob Barnard brings home the win with 115 laps. Followed by Ryan Stuart on 112 laps and Warren Selby on 109 laps. So that gives us the top 8 drivers of the day. Tim Bailey. Rob Whalley. Noah Bailey. Louis Selby. Dan Skeels. Ryan Stuart. Warren Selby. Rob Barnard. 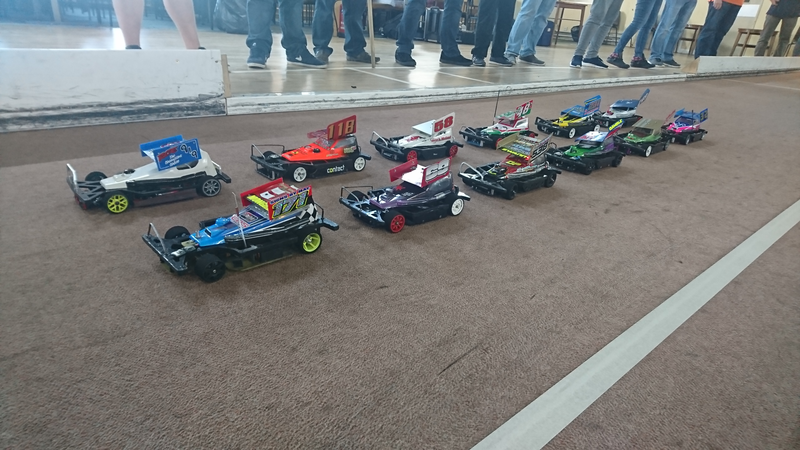 So while we were waiting for all the finalists to check their cars over and charge their batteries, we had round 1 of the Grand National Championship on track. Now these guys know how to race. 20 cars. Drivers from all over the uk. Juniors and seniors alike. Current grand national champion Mark Rodgers also on track. Now this is the part of the day that’s the most tense. Father Daughter competition. Brothers fighting it out for bragging rights. Uncle and nephew battles. And just the most competitive race of the day. Also, the most fun race of the day. From start to finish, everyone smiling laughing and most definitely crashing. Marshalls being kept on their toes for a whole 6 minutes. After the 6 minute buzzer young Dan Knight crossed the line first with 79 laps. Followed by Ian Ward with 73 laps and coming in 3rd was Freddie Clarke with 73 laps. Cars lined up on the grid. Tim Bailey in the 817 car taking pole position. Rob Whalley next to him and his young nephew Noah behind him. No pressure then Timothy!!! Well what a great first round that was. Karen and Emma in the kitchen kept everyone well fed and watered throughout the day. So Thankyou ladies. TTT team putting on a great round. Great venue, clean and warm. 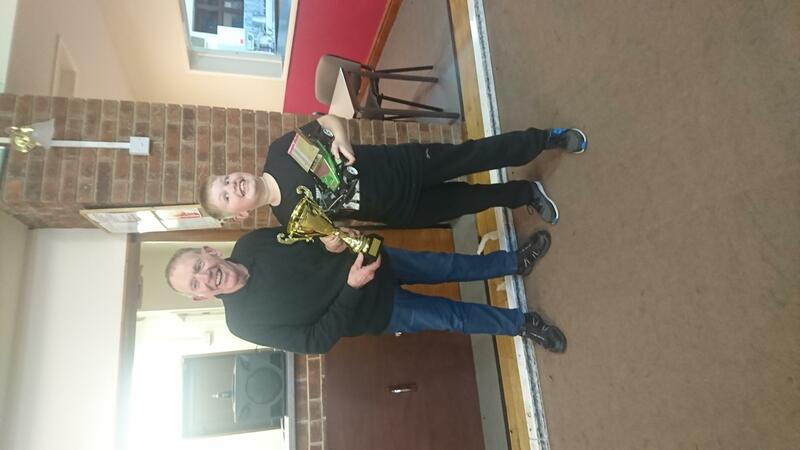 Thank you to David Tomlinson for great organisation, to Tony Perry for the fantastic trophies and to Ryan Stuart for doing all the points. Not many people get to see behind the scenes, but ide just like to say that Dave and Ryan both work so hard to make sure everything is spot on and the points are correct. After my first taste of Oval 12th racing I saw myself on the road again this time to the TTT Raceway the little village of Stanton just outside of Burton on Trent.